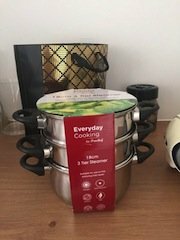 A brand new unopened Everyday Cooking 18cm three tier stainless steel and bakelite steamer. 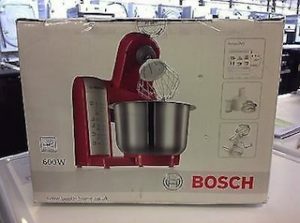 A brand new in box Bosch 600w metallic red and stainless steel food mixer. An unusual four seater left hand corner sofa on chrome legs, upholstered in lime green and white faux leather. 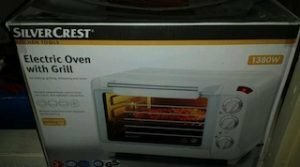 A brand new in box Silver Crest white and stainless steel 1380w electric oven and grill. 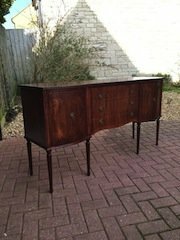 A solid mahogany vintage sideboard on tall fluted legs, having two cupboards to either side of three central drawers. 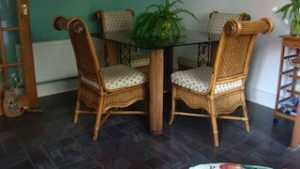 A square cane glass topped dining table, together with four matching scroll back dining chairs. 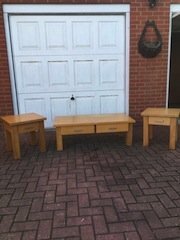 A three piece solid pine furniture set, includes a large two drawer coffee table and a pair of one drawer side tables. 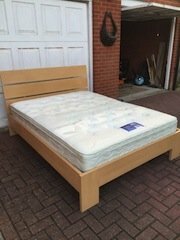 A solid pine king size bed frame with removable headboard, together with a kingsize mattress. 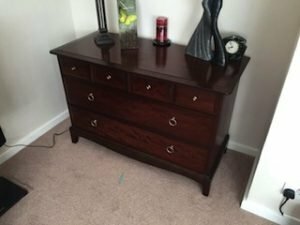 A vintage mahogany chest of drawers, having four small drawers over two large drawers. 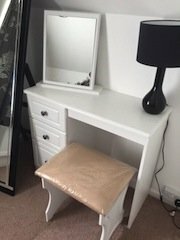 A white solid wood dressing table, together with a matching stool and removable swing mirror. 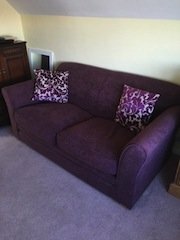 A two seater high back sofa on square pine feet, upholstered in deep purple velour, together with two damask patterned cushions. 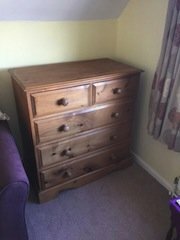 A solid pine country style chest of drawers, having two small drawers above three large drawers. 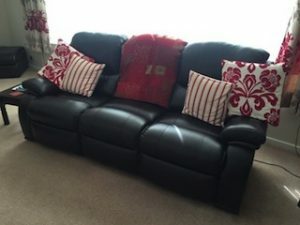 A three seater high back sofa upholstered in black faux leather, together with four floral and striped patterned cushions. 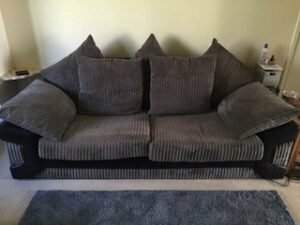 A two seater low back sofa, upholstered in grey corded velour and black faux leather. 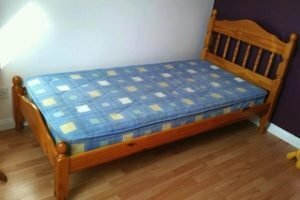 A solid pine single bed with removable large headboard, together with a blue single mattress. 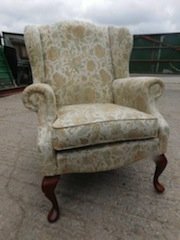 A vintage wingback gentlemans armchair on mahogany legs, upholstered in floral patterned fabric. 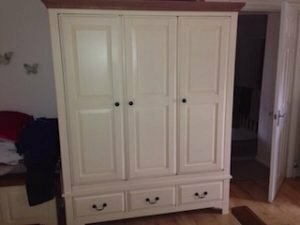 A tall standing hand painted white solid wood triple wardrobe, having a double and single wardrobe above three drawers. 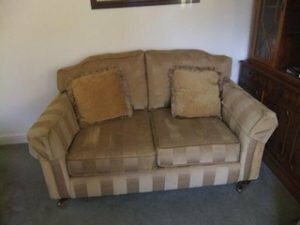 A two seater high back vintage sofa on mahogany legs and brass castors, upholstered in champagne striped fabric. A large mahogany drop leaf dining table, together with six matching high back dining chairs. 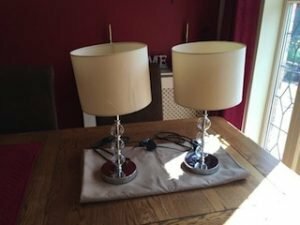 A pair of glass bubble table lamps on circular chrome bases, together with cream lampshades.